mySouthampton link - please don't delete! The Piazza is the largest food court on the Highfield Campus offering an extensive and diverse range of food and drink. The food court is open from breakfast until early evening affording you time and convenience to dine around your busy academic and social commitments. There is a variety of hot and cold food counters open throughout the day offering fast, authentic street and traditional food, all of which are aimed at providing fresh, nutritional, diverse and affordable meals. A broad selection of vegetarian food is served each day and we aim to cater for a multitude of tastes and dietary preferences. 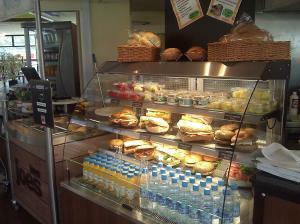 The food court also offers your favourite Starbucks drinks, pastries and cakes. Whether you intend to dine in or pick up a takeaway there are plenty of foods to choose from and staff at hand to assist. Catered student cards are accepted during lunchtime service. We will always be pleased to hear your feedback or requests and look forward to seeing you.